Boston's Chinatown, the third largest in the U.S., boasts some of thebest dim sum restaurants anywhere. 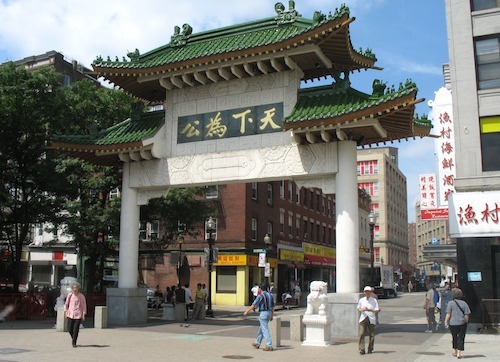 If you're wondering where to go for brunch in Boston, consider Chinatown! However, figuring out which Boston Chinatown restaurants serve the best dim sum can be tricky - so I've put together this short guide to the best dim sum restaurants in the city, as well as tips about what you'll find in each one. What will you find in Boston's dim sum restaurants? Dim sum represents the Chinese version of "small plates," and is served in the morning, and often through mid-afternoon on weekends - the perfect brunch! Typical dim sum dishes in the dim sum restaurants in Boston's Chinatown include steamed buns ("bao") with savory or sweet fillings, dumplings of all varieties, ribs, crab claws, tofu and other kinds of puddings, beef balls, chicken wings, noodle rolls, little tarts, siu mai, taro (sort of like sweet potato), scallion pancakes, sticky rice in lotus leaves, fried turnip cakes, and for the more adventurous, specialties such preserved eggs and chicken feet. Most of Boston's dim sum restaurants also offer congee, a rice porridge served with various types of tasty tidbits. In larger Boston Chinatown restaurants serving dim sum, waiters go from table to table withsteam carts of dim sum offerings fresh from the kitchen. If you don't speak Cantonese, the Chinese language most frequently heard in Boston's Chinatown, just point to what you want. And if you're not familiar with dim sum dishes, getting to see the choices before choosing can help you know what you're getting. Smaller dim sum restaurants give you apaper card with a list of their selections - just check off what you want, and the dishes will appear from the kitchen as soon as they're ready. Some of Boston's Chinatown restaurants serve dim sum every day, while others offer it only on weekends. Weekday selections tend to be rather limited, so go on weekends for the most choices. Many of the restaurants serving dim sum open as early as8am, and continue serving these small dishes through mid-afternoon. You can also order regular dishes from most of the restaurants. Most dim sum selections costjust a few dollars - definitely a top choice among Boston Cheap Eats. Spending more than $10 per person for food is hard, unless you're enormously hungry. Tea is usually served at no cost, but you can order other beverages if you want. When you mention "dim sum restaurant" in Boston, most people immediately think of China Pearl (9 Tyler Street). Although like many of Boston's Chinese restaurants China Pearl looks small on the outside, inside it is vast and frequently very crowded. And like most other Chinatown restaurants, it's not fancy. People tend to love it or hate it. 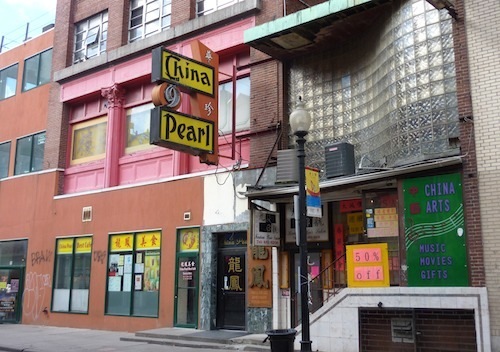 China Pearl in Boston's Chinatown - famous for dim sum! Waitresses bustle around with carts of dim sum fresh from the kitchen. If you don't see anything you like on one cart, you're sure to find plenty on the next. Lines get long on the weekends; arrive before 10am for the shortest wait. 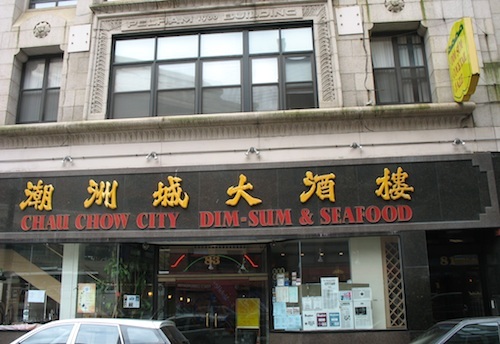 Another Boston favorite serving dim sum from steam carts is Chau Chow City (83 Essex Street; go up to the 2nd floor dining room for dim sum). In many ways, it's fairly similar China Pearl - both are very good. Also like China Pearl, Chau Chow City has plenty of large tables - excellent place to come with a group. A much smaller place, and my personal favorite for dim sum at the moment, is Great Taste Bakery and Restaurant (61 Beach Street). Here, you order off a menu of sorts - really just a paper list. You check the items that you want. 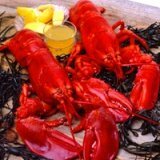 They arrive at the table, piping hot, as soon as the kitchen prepares them. The congee is especially good here, especially the Bone Congee with Dried Vegetables. However, I am in love with the shrimp dumplings. You'll find shrimp dumplings at all the dim sum restaurants in Chinatown, but those at Great Taste Bakery and Restaurants pack an exceptional amount of flavor and textures into the bite-sized morsels - sweet, salty, crunchy, smooth - I wish I had a plateful in front of me right now. Most tables seat only 4 - great place to come for quiet conversation. 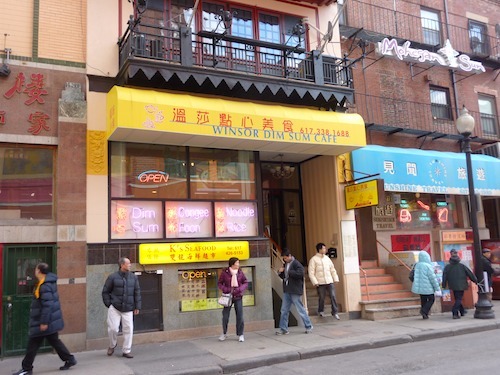 Winsor Dim Sum Cafe (10 Tyler Street, between Beach and Kneeland Streets), is also a small place, and as at Great Taste Bakery, you order by checking off what you want on a paper list. The dim sum here is also freshly prepared and delicious - in fact, Winsor Dim Sum comes close to Great Taste Bakery at the top of my personal "favorites" list. What's wonderful here? Not to be missed are the fried turnip cakes, clams with black beans, scallion pancakes, congee with you tiao (fried dough sticks- you have to order them separately), stuffed eggplants, lo mai gai (sticky rice crab rangoon, and yes, the shrimp dumplings. You're sure to find lots of other favorites also. 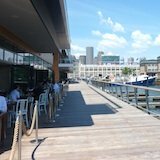 Only 4 dim sum restaurants in Boston?!? No, don't worry - this is only a small sampling! 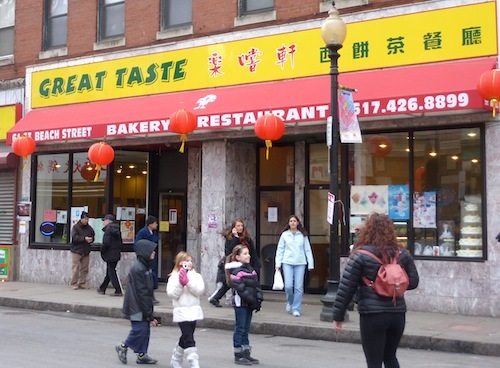 Walk around Boston's Chinatown on a Sunday morning, and you'll see "Dim Sum" signs in front of many others - as well as happy crowds of dim sum fans. Chinese New Year Parade - Don't miss Chinatown's biggest celebration! 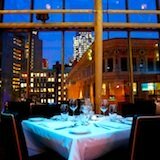 Check out Dine Out Boston savings!